Hulu Plus vs Netflix vs Amazon Prime Instant – Who Reigns Supreme? Netflix has long been touted as the best of the best when it comes to online streaming services. However, their closest competitors; Amazon Prime and Hulu Plus, are making strides to push Netflix out of the top spot. But are they good enough to do it? Originally, I was going to write my review purely just on Hulu plus vs Netflix. But I had to include the now mighty Amazon prime as it seemed unfair to leave them out. They have really upped their game recently with some smash hit releases and massive funding into producing new TV series. Amazon just inked a distribution deal with HBO not too long ago, giving them and their Prime subscribers access to several original series that has already aired (not current content.) This deal is sure to grow and expand into offering HBO’s new programming too if it becomes profitable for HBO to do so. Though it’s unclear if or when this will happen. Hulu, while not currently the most popular, is the only online resource outside of illegal torrent sites to offer currently aired shows, which is a major draw for some folks. However, there are limitations to what they offer. If you’re already feeling torn about what service is best for you; which offers the best pricing, selection, and programming extras, you’re not alone. With changes constantly brewing, and rumours and opinions about each service running rampant by the day, consumers just like you have a lot of questions to ask before dropping your hard-earned cash down for a monthly or yearly commitment. Let’s get on with it and see just how well these 3 online streaming heavyweights stack up side-by-side! A new Netflix subscription will run you $8.99 per month. If you signed up before May/2014, you’re paying $7.99 and will be able to keep that pricing level until May/2016. So, assuming you’re going to stick it out for a full year, a new subscription to Netflix will cost a total of $107.88 for 12 months. However, you can get a 30 day Netflix free trial if you look in the right places. Amazon Prime drove their prices from $79 at the start of 2014, to $99 ($8.25 per month) on March 20th of 2014. This is likely due to the company’s need to cover the costs of their new exclusive deal with HBO, but an extra $20 is a lot of money too. Particularly considering said deal only gives them access to previously aired “HBO Classics” and that many customers (perhaps yourself included) may not care for HBO’s unique style of programming. At just $7.99 a month ($95.88 per year), Hulu Plus can call themselves the cheapest online streaming service, by a very small margin. As far as pricing goes, if you enjoy Hulu’s programming choices, it’s conceivable that they’re the least likely to drive up prices in the near future since they can keep them low by serving up advertisements to you while you watch your favourite programs, which they do. *Hulu Plus wins the pricing game by a small margin. However, as we all know, the cheapest isn’t always the best. Keep reading to learn more. From a connectivity standpoint, neither of these three services offer any advantage over the other. You can view any of them from pretty much any device that’s able to connect to the Internet. Each respective service does, however, have uniquely different Graphical User Interfaces (GUI’s). Personal preferences often come into play when talking about GUI’s, but a refined user experience often comes down to who’ve been around the longest – those who’ve received the most customer feedback and made improvements based on that feedback. Netflix, hands down, has the sharpest and most visually appealing interface of all the online streamers. It’s sharp, user-friendly, and easy enough to use and navigate that new users will have no trouble finding programming to watch or to change personal options. You can set up different programming profiles for different family members, including children, so they don’t have access to shows that aren’t age-appropriate. Once an individual user has watched Netflix for a while, the interface will start to recommend shows, movies and documentaries based on what you’ve watched previously in the form of their Top Picks selection. Amazon Prime has an interface that’s far less intuitive and descriptive than Netflix. It’s okay if you know what you want to watch, or if you have a specific genre in mind. You can filter search preferences to search by genre (eg., romantic comedy, action), mood (eg., offbeat, touching), or theme (eg., mature, fantasy). There are tons of themes to choose from. One major drawback between Prime and Netflix is the hover-over display information that shows up for each program. While Netflix’s info is very descriptive, Prime offers a short blurb (if you’re lucky) that does little for helping one to make a decision. Currently, the Amazon Prime iPod app is the only part of the service that offers personalized recommendations on the home screen. This option isn’t offered on PC’s, Smart TV’s, or gaming devices. Unlike the drawbacks of using Amazon Prime over Netflix, Hulu Plus has an excellent UI. They’ve obviously taken notes from Netflix when building their Home Screen GUI. Upon signing into your Plus account, you’ll immediately see a list of your favourites, based on your previous settings. The service also offers recommendations based on what you usually watch. One of the handiest features is the ability to search for specific networks (eg., NBC, CW, WB) if you prefer one’s programming over another. *Amazon Prime loses the battle of the GUI for sure. 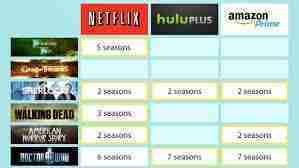 When it comes to choosing Netflix or Hulu Plus, they stack up pretty much the same as far as ease of use goes. The television programming selection is where the real blood in the Netflix vs Amazon Prime Instant vs Hulu Plus battle really gets spilled. In terms of previously-aired series (some of which may still be airing new shows), here’s a short list of the most popular television shows compared between the 3 providers. You can read the full list of television shows offered by each on Lifehacker: Netflix vs Amazon Prime Instant vs Hulu Plus Television Programming. *While the shows that are compared above are by no means everyone’s cup of tea, it should be obvious that Netflix has the absolute best selection of current and past popular television programming. Though, it’s only fair to point out that Hulu Plus offers recently aired episodes of a few popular shows too, which Netflix does not. Hulu Plus also indexes and links you to legal streaming (on the respective network’s website) of shows they don’t carry. If old HBO shows like The Wire and True Blood are your bags of chips, then you might consider Amazon Prime. Netflix definitely has the most popular original programming, with their most critically-acclaimed series being House of Cards and Orange is the New Black. However, to be fair: Netflix has offered original programming much longer than Amazon Prime Instant or Hulu Plus have. *Some of these Prime and Hulu programs are pretty good, however, their production (and acting) budget’s are nowhere near that of Netflix’s (consider just the calibre of actors on Netflix shows: Kevin Spacey, Robin Penn, Kate Mara, Laura Prepon, Taylor Schilling, etc.) Netflix gets the win in the original programming category. The main decision still comes down to personal preferences; though most of you will likely lean toward Netflix. They offer more classic television shows, more acclaimed original programming, and more movies. Lots more movies, some you’ve even heard of! The same of which can’t really be said for Amazon Prime or Hulu Plus. That doesn’t mean that Netflix is the hands-down winner; it just means that most people who wanna ditch their $100+ per month cable or satellite service for a service that offers online streaming will choose Netflix’s well-established service, over the lesser known Prime or Plus. Each service offers a free month to test them out. Try each and see what works best for your needs. Simply discontinue before the first-month ends and you can’t lose.